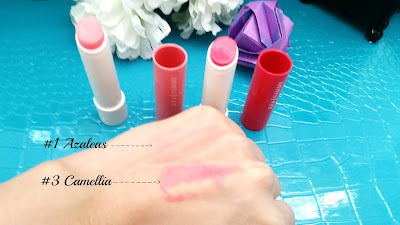 Today I'm going to share with you some of my favorite lip products since last summer. These are Innisfree's Eco Flower Tint Balms. 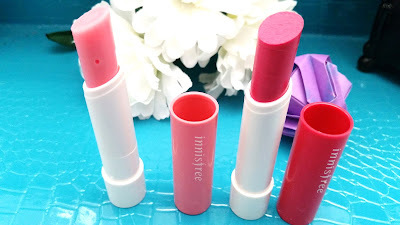 Before tint balms, I was a lip balm gal with the occasional ventures into lipsticks and lip glosses. It's not that I didn't like them or anything, it was more that my lips aren't always suited for them. You see I'm prone to have dry and chapped lips. No matter how much water I drank and how hydrated I keep my lips, they always find ways to become dry and chapped again. Then, I finalized my lip care routine that helps to keep my lips soft and moisturized and keeps chapped and dry lips at bay. So, I can finally branch out on my lip products and try new things. 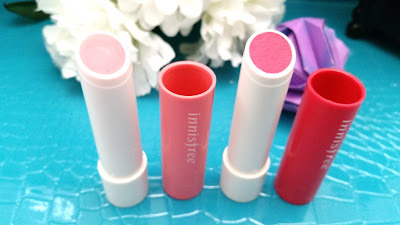 Some of the first new lip products I've been wanting to try were tint balms. Innisfree is one of my favorite brands. I think it's because I have been using their products for a couple of years now and for the most part, they've worked for me and my skin. So, when I decided to try out tinted lip balms, I naturally looked toward theirs first. 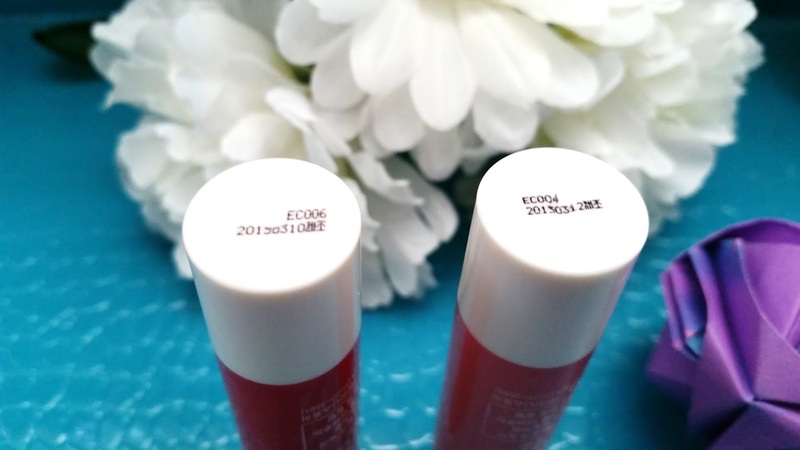 That's when I came across the Eco Flower Tint Balms. I purchased these at the beginning of 2015. It was actually on sale, a buy 1 get 1 promotion that Innisfree has from time to time. So I chose 2 colors that I think I would wear the most. Let's get to know them! Product Description: Tinted lip balms that melts onto the lips easily. 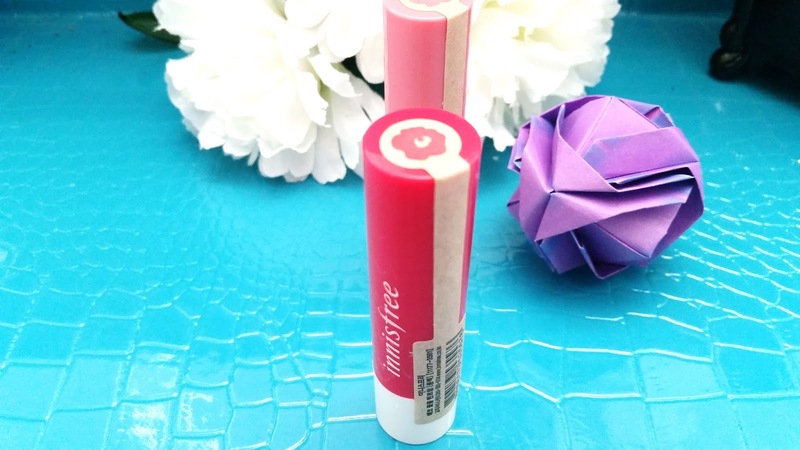 Providing a touch of color that adds liveliness to the lips. 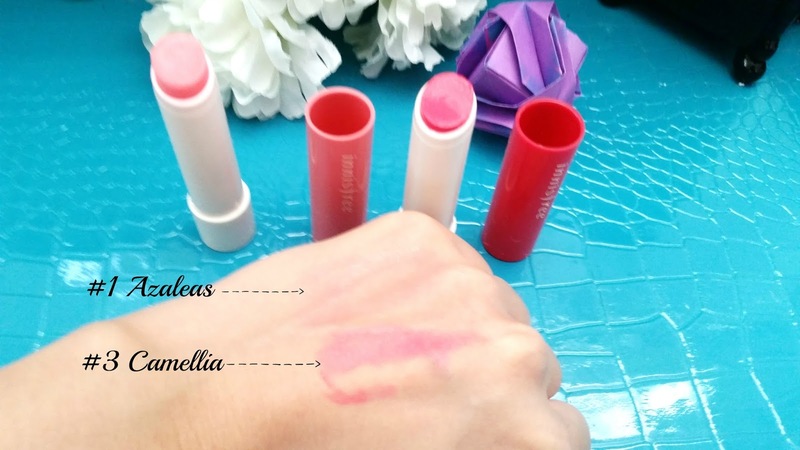 These tinted lip balms can moisturize the lips while its vivid color stains the lips. To Use: Gently spread the tint balm on top of the lips. [no.1] DIISOSTEARYL MALATE, PHYTOSTERYL/ ISOSTEARYL/ CETYL/ STEARYL/ BEHENYL DIMER DILINOLEATE, CAPRYLIC/CAPRIC TRIGLYCERIDE, TRIDECYL TRIMELLITATE, OCTYLDODECANOL, MICROCRYSTALLINE WAX, POLYETHYLENE, JOJOBA ESTERS, DIPENTAERYTHRITYL TRI-POLYHYDROXYSTEARATE, TRIOCTYLDODECYL CITRATE, CERESIN, SILICA, ROSA CANINA SEED EXTRACT, ROSA CENTIFOLIA FLOWER WATER, ACACIA SENEGAL FLOWER/STEM EXTRACT, DIOSPYROS KAKI LEAF EXTRACT, LYCIUM CHINENSE FRUIT EXTRACT, CHRYSANTHEMUM MORIFOLIUM FLOWER EXTRACT, LONICERA JAPONICA (HONEYSUCKLE) FLOWER EXTRACT, CAMELLIA SINENSIS LEAF EXTRACT, ZIZYPHUS JUJUBA FRUIT EXTRACT, LACTOBACILLUS FERMENT, RHODODENDRON MUCRONULATUM FLOWER EXTRACT, CAPRYLYL GLYCOL, GLYCERYL CAPRYLATE, TITANIUM DIOXIDE, WATER, FRAGRANCE, PHENOXYETHANOL, RED 21, RED 6, RED 7. [no.3] DIISOSTEARYL MALATE, PHYTOSTERYL/ ISOSTEARYL/ CETYL/ STEARYL/ BEHENYL DIMER DILINOLEATE, CAPRYLIC/CAPRIC TRIGLYCERIDE, TRIDECYL TRIMELLITATE, OCTYLDODECANOL, MICROCRYSTALLINE WAX, POLYETHYLENE, JOJOBA ESTERS, DIPENTAERYTHRITYL TRI-POLYHYDROXYSTEARATE, TRIOCTYLDODECYL CITRATE, POLYGLYCERYL-2 TRIISOSTEARATE, TITANIUM DIOXIDE, CERESIN, SILICA, ROSA CANINA SEED EXTRACT, ROSA CENTIFOLIA FLOWER WATER, CAMELLIA JAPONICA FLOWER EXTRACT, PRUNUS MUME FRUIT EXTRACT, ACACIA SENEGAL FLOWER/STEM EXTRACT, CAPRYLYL GLYCOL, GLYCERYL CAPRYLATE, BARIUM SULFATE, ALUMINUM HYDROXIDE, ROSIN, WATER, FRAGRANCE, PHENOXYETHANOL, RED 6, RED 27, CI 15850:1, YELLOW 5 LAKE. 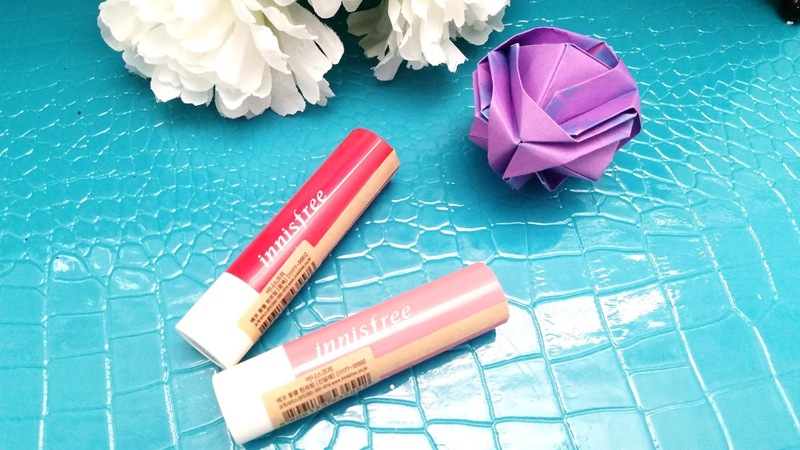 Packaging: Like most Innisfree products, these tinted lip balms comes in some simple and sleek packaging. The packaging includes the brand's name and the manufacturing dates are on the bottom of the product. The product's actual information is printed on the safety seals only. The lip balms come in retractable containers, making them easy to use. Scent: This is the interesting part. Fragrances are added to both of these tint balms and when I first got them I could definitely pick up some floral scents, which I didn't mind at all. However, I've noticed that over time, the scents lightens and it becomes hardly noticeable. Texture: The tinted lip balms are both creamy in texture and applies easily. Their textures are very similar to lip balms. However, they feel a bit creamier than lip balms. Both of these also applies smoothly. Color: The Innisfree Eco Flower Tint Balms have 5 colors overall and they are #1 Azaleas, #2 Garden Balsam, #3 Camellia, #4 Rose, and #5 Calendula. The 2 colors I have here are #1 Azaleas and #3 Camellia. Azaleas is a light pink color that's not super pigmented. It's great for day to day wear. The color can be layered a bit to create a more noticeable sheer pink. #3 Camellia is a rosy, soft red color. It's very pigmented and buildable to a richer rosy-red color. Both colors are on the sheer side, but Camellia is more pigmented and less sheer than Azaleas. My Thoughts: I chose these 2 colors out of the 5 color choices because I thought I would use these the most. I found #1 Azaleas to be a pretty light pink, so light that you can hardly see it in the swatch below. I like the lightness of it because I can wear it on a daily basis when I do my no-makeup makeup look. As for #3 Camellia, it's a gorgeous rosy-red color, for days when I want more color on my lips. While Camellia can be very pigmented, I found that if I dab lightly on the lips, it can create a lighter and softer rosy-red look. What's awesome about these 2 tinted lip balms is that you can layer on the color. It's not super noticeable with Azaleas, but with Camellia, you can layer it to a richer rosy-red. Since they are tinted lip balms, their downside is that they are not indestructible. Their long lasting power is decent, that's assuming you don't eat/ drink etc. When you do eat/drink, the colors will fade bit by bit. So, I do carry these tint balms around for reapplication. These tinted lip balms can stain the lips a bit, so it's not like the colors disappear completely. However, it's not the same as a staining lip tint, so sometimes reapplications are still needed. 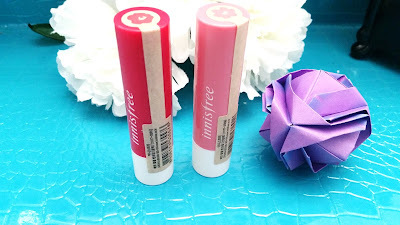 Final Thoughts: I really, really love these Innisfree Eco Flower Tint Balms. I am so glad I gave these a try. They have become a staple for me and they have a permanent spot in my makeup pouch. I love that they are moisturizing and super easy to use. I like that Azaleas is more of a day-to-day color while Camellia can go from a light rosy red to a rich red. They also pair perfectly together to create a nice gradient lip look. Would I repurchase these in the future? Yes! I love these tint balms and I would definitely purchase them again. I might even try out the other colors too. Do I think these are worth a try? Yes~ These tint balms are really nice and totally worth it. They are moisturizing, easy to use, and their colors are lovely. Plus, their colors are build-able too so you can get a variation of colors depending on how much or how less of the product you use. These tint balms also aren't expensive and if you wait for Innisfree's buy 1 get 1 deals then they'd be like $4.5 each.